By Golly, Molly! : Let's Play the Glad Game! Among our top picks: Raiders of the Lost Ark, Sound of Music, Meatballs, Funny Girl, Grease 2, Swiss Family Robinson, Girls Just Want to have Fun, Lucas, Back to the Future, and... my favorite... Pollyanna. Ah, Pollyanna. Makes me so happy. I just watched it with my 10-year-old for the very first time. And if you haven't seen it, this may be lost on you... but my daughter kept saying, "Who cares about the stupid doll! Just get into your bedroom!" But the parts that have really stuck with us, the parts that have entered our ordinary conversations, were when Pollyanna played her glad game. You're at Yogurtland and people actually think there's supposed to be a line. Ack! They have no idea they can pop in and out of toppings and yogurt flavors, squeezing in here and there. And you suddenly find yourself becoming undone (internally, of course). What other situations can we be glad in? You slept horribly, afraid you've got the perimenopause. But wait, you have an unopened bag of $10.99 dark roast Peet's Coffee and it just so happens to be your favorite kind of California morning outside (doesn't have to be California, but helps) - cool and overcast, super marine-layery, pigeons are cooing. And once again, you just played the glad game! Now back to my childhood at Video Max... what did I do if I couldn't find a single good movie, and Goonies wasn't available to rent for the 11th time? After wondering if Blockbuster might have it (being honest), I would think about the glad game and be glad about the pool we had waiting for us, all filled up and warmed by the sun. 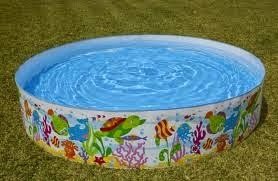 *A pool that never ever ever EVER looked anything like the picture on the box. Oh but (I'm about to play the glad game), I sure did love smelling the plasticky rubberness of it when pulling it out of the box. This is a good one Terri! !